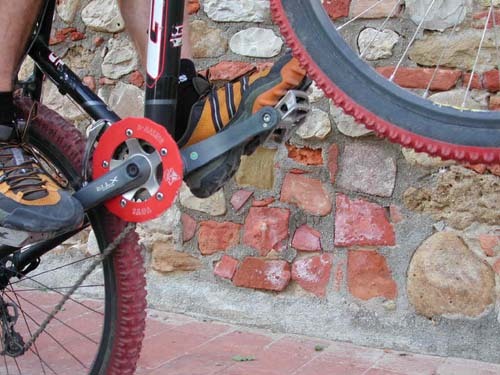 First of all, you need a really good rear brake — you should have 100% braking power with just 1 finger. And it’s important to develop a sensitive feeling for your rear brake because the brake lever is your best friend when dancing on your back wheel. Try to use only one finger, it’s better for brake modulation and the remaining fingers are needed to firmly hold the handlebars. Secondly your foot position is very important. Soft-soled shoes, like an outdoor or tennis shoe are better than SPD shoes for trials. Clipless shoes are usually too stiff — you’ll loose the direct feeling and contact that’s necessary to be one with your bike — plus you don’t really want to be clipped in when you’re learning. Have your favorite foot, or “chocolate foot” forward and make sure your heel is below the crank arm, as in photo 8. The trick is to get the rear tire under your body. At this point, the rear hub should be below you as in photo 2; the hub should move from behind you as in the start position pictured in photo 1. Once on the back wheel, it’s easier for some people to hop backwards at the beginning, and later you can start to practice hopping in one spot, then try to hop forward. It may be easier to start the back wheel hop from a little Endo or nose-stand, using the weight-shift to get onto the back wheel. To do this, start by slowly rolling forward and pull the front brake until the rear wheel comes off the ground. As soon the rear wheel drops down to the ground, pull the rear brake and use the momentum of the shifting weight to get onto the rear wheel. Start hopping immediately with the rear brake locked. As mentioned earlier some prefer to keep hopping backwards to get the feel for it. To hop in one spot from a standstill as in photo 1, pull the front wheel off the ground with your arms, while at the same time, push the rear wheel under your body with your feet. Remember, once you’re up on the back wheel, the rear hub should be under you not and not behind you (see photo 2) and you should immediately start doing little hops. At the beginning it’s quite difficult and a strange feeling, but after a few days you should be able to do at least a few hops. Remember, the lower your front wheel is to the ground, the harder it is to keep it in the air. The most important things to focus on for hopping forward are balance, your footwork and brake modulation. To hop forward you’ll need to do small pedal kicks forward while releasing the rear brake for a split second, but be sure the rear brake is locked before you land again. Try to be very flexible in your feet (remember to keep that forward heal below the crank arm tip.) Use a medium-to-low gear, just not too low or you won’t go anywhere. You don’t lift your feet up, you actually do the opposite, pushing your feet down, that way they stay in constant contact with the pedals, and you don’t loose contact with your bike. To hop forward, pull back on your bars while pedal kicking the rear wheel slightly forward as in photos 2 and 3. First practice on a low, safe drop-off like a curb or small wall and don’t do bigger drops until you’re a 100% sure you can pull it. Use the same technique as described above to get on your back wheel, just use as many little hops as you need until your rear tire is all the way on the edge as in photo 3. Don’t freak out and stop hopping once your front wheel is in the air, you got to be committed and get used to heights –even if it’s only a few inches off the ground. Now all you have to do is one additional hop and you’ll make it. 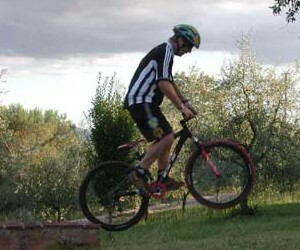 Try to land on the rear wheel first, but not too steep, like in photo 4, because you might loop over backwards. Try to land smoothly, absorb the impact with your arms and legs by bending your knees at the moment of impact. Also try to land with your weight centered over the bike to avoid bending your rims. Again, practice in a safe situation first and make sure your take-off edge is fairly smooth and not too slippery. You’ll use the same technique as described before, except you have to be very explosive, and timing is even more critical. In extreme situations, it helps to lower your front wheel a bit while it’s in the air and you’re hopping on your rear tire (photo 5.) Using a quick motion, first throw your weight forward (photo 6) and then, almost simultaneously, pedal kick your bike forward so the rear wheel goes under your body again, while pulling up on the front wheel as in photo 7. Fat tires (2.2 or bigger) make it easier to hop and balance and smoother for the landings. Run between 40 – 50 psi tire pressure, depending on your weight, tire and rim choice. Remember, before you try any of this you need to be able to visualize the move in your head. That’s only possible if you truly understand what I have explained above. Shin protectors are recommended, not to mention a helmet and gloves….